Copy Octr 1st 1806 L.I.F. Pupil and assistant May 1794 - September 1808. 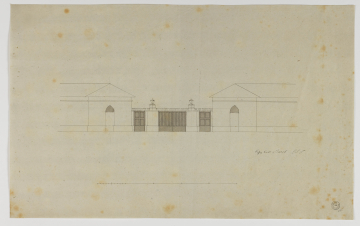 Entry in Soane office Day Book for 1 October 1806. The same design as drawing , that is, two six-sided piers each bearing a lamp and with a door at both ends and a double gate in the centre.